The title quote is from the real Maria von Trapp when she first met Christopher Plummer who was to play her husband in the movie version of the Sound of Music. According to one version of the story, the comment was proceeded by the former nun shocking Plummer by giving him a big kiss on the lips. 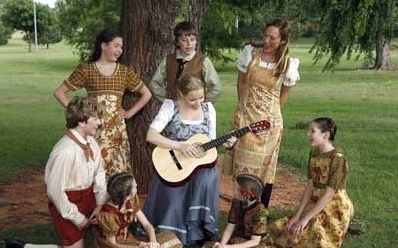 Just a little history of the von Trapp family to fill out my comments about going to the opening of Lyric Theater’s production of the Sound of Music last night. I had very high expectations and was not in the least disappointed. It only took one song for me to forgive Marissa McGowan for not being Julie Andrews. Her character and her voice won me over completely about half way through her second song. She did a great job teaching the Mother Superior to sing “My Favorite Things” in the abbey. The leads in Lyric productions have been consistently good for several years, but Marissa was truly outstanding. By the end I think she had captured more of the real character of Maria Augusta Kutschera von Trapp than the afore mentioned Miss Andrews. I highly recommend this production to anyone who enjoys good musical theater. I am anxiously awaiting Lyric’s second production, Swing, coming in two weeks.